AzhwAr says that it is not that he had lost his opportunity of having dharSan of emperumAn because he could not go to thiruppARkadal or because he was not present when emperumAn measured the worlds. When he came in an even simpler form as krishNa , he lost, he says. AzhwAr mercifully speaks about both vAmanAvathAram and krishNAvathAram in the same breath because in both these incarnations, emperumAn (1) embraced all without distinguishing between the great and the lowly people, (2) had beauty, (3) wealth, (4) affection towards followers etc. 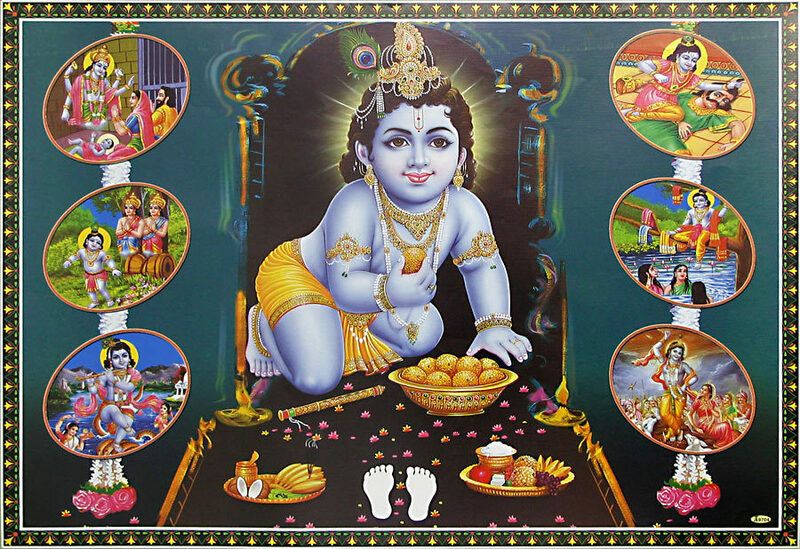 nAnRa mulaith thalai nanju uNdu – pUthanA, the demon friend of kamsa, came in the form of yaSOdhA, in order to kill krishNa. Since she wanted to feed him, she had excess milk in her bosom, due to which her bosom was hanging. Once krishNa drank the milk that she offered, she turned into her old (demoniacal) form and fell down. The true self of anyone who comes near him [emperumAn] would be exposed. Thus pUthanA lost the form that she had assumed (of yaSOdhA) and attained her demoniacal form. uRi veNNey thOnRa uNdAn – he caught hold of hoops (a network of ropes to place pots from ceiling) which had butter kept in pots and ate it. Alternatively, not knowing how to hide his stealing, he stole butter such that everyone know that he had stolen and called him a thief. It went to such an extent that even SisupAlan (his cousin and a staunch enemy) knew of this and called him names. It is hinted through this that he cannot remain without taking hold of articles that belong to those who are friendly towards him. Since both”nanju uNdu” (eating poison) and ”veNNey uNdu” (eating butter) are mentioned in the same breath, it is brought out clearly that the belongings of those who are friendly towards him and those who are inimical towards him are treated equally by him – he desires both. venRi sUzh kaliRRai – the elephant which is always victorious. Instead of being defeated, the elephant, kuvalayApIdam, had the ability to defeat its enemies. Alternatively, it can be construed as the elephant which was very victorious. UnRip porudhu udaivu kaNdAnum – he fought at close quarters with kuvalayApIdam, as if he is an expert in fighting elephants, and converted its body into an implement for keeping weapons. There is another form for this sequence – porudhu idaivu kaNdAnum – here, he fought with the elephant, made it wizened and killed it. puLLin vAy kINdAnum – the one who killed bakAsura, who came in the form of a crane, by tearing open its mouth is also the one who killed the two demons, yamaLa and arjuna, who took the form of twin trees by crawling between them and tearing them apart (marudhidai pOy). maN aLandha mAl – the one who went between the arjuna trees and killed the two demons is also the one who measured the worlds with his divine feet. Once AzhwAr thought of krishNa, the form of thrivikrama came to his mind since both were simplicity personified. We shall move on to the 19th pAsuram. This entry was posted in iyaRpA, mudhal thiruvandhAdhi on June 27, 2017 by T N Krishnan.